Read what our clients have to say about some of our recently completed remodeling jobs. Forget the image of a dark, basement-level rec room with beat-up furniture. A Deerfield family gained a sophisticated retreat that includes a home theater, onyx bar, wine cellar and much more, thanks to Basements by G.C.M..
Basements by G.C.M. offers homeowners in Lake County (Deerfield, Northbrook, Highland Park, Lake Forest, Mettawa, Libertyville, Vernon Hills, Mundelein, and more) with high quality and professional basement finishing and remodeling services. At Basements by G.C.M., we understand that the design and remodeling process can be overwhelming at times, and that finding the right North Shore home remodeling contractor can often be difficult. Whether you’re planning a home theater, recreation room, a man cave, or have other home remodeling ideas, the qualities you look for in a contractor will essentially be the foundation of your entire experience. 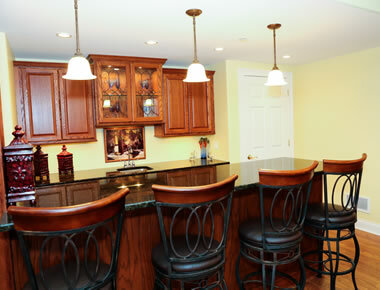 Our primary focus is on basement finishing and remodeling. It’s what we do. 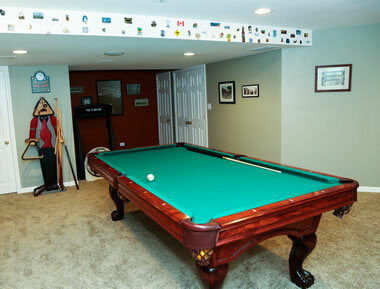 We can turn that dark and dreary basement into a livable and playable part of your home. We will work with you (the homeowner) to design and layout the basement around your needs and your budget. Tell us what you and your family like — let us figure out how to reclaim all that unused space sitting under your house. Our North Chicago and Lake County construction experts spend time upfront getting to know clients and to understand their lives. Until you know the client, you cannot design a project that fits their long term needs. Exacting details and quality construction of the wrong design will not serve our customers well. Building the right design, on schedule, on budget and to exacting details with quality construction is our passion. We proudly work with customers throughout Northern Lake County in Deerfield, Northbrook, Highland Park or Lake Forest, Mettawa, Libertyville, Vernon Hills, Mundelein, and the surrounding area. We handle the entire project — from initial meeting, to design, construction and clean up.